POP surveys all of our orchard partners at season’s end and we like to share what we’ve learned each year! Each year, we ask partners about their orchards, orchard challenges, orchard value, community involvement, yields, distribution methods, how we perform as partners, our educational offerings, and how to improve. In all, 52 of 62 POP partners (84%) participated in our annual Partner Survey in November and December. 52 of 62 (84%) of POP orchard partners participated in this year’s annual survey. For the first time, ‘Gathering and Community Space’ was rated most often as having the “highest value” (37%) with a close second between ‘Educational Opportunities’ and ‘Beauty and Neighborhood Greening’ (35%). “Beauty & Neighborhood Greening”, “Educational Opportunities”, and “Community Health and Nutrition” were rated as “High Value” by just under half of respondents. Voting drops off significantly in categories of “Moderate Value” with half of respondents electing not to assign both “Low Value” and “Lowest Value”. Among the votes cast in these lower categories, “Food Production and Distribution” received the most votes followed by “Environmental Impact”. The 44% of partners that rate “Food Production and Distribution” as “High Value” or “Highest Value” tend to be more established plantings, organizations centered around food access, or organizations with market-based endeavors. Smaller urban spaces with few trees will be more valued for their educational impact rather than their impact on the food system, while some orchards are either too young or are struggling with pest, disease, and weather related factors preventing them from seeing full yields. Stories illustrating the value of the orchard always provide some heartening responses that help provide qualitative support for the impact of POP’s work. Repeating themes include educating and exposing people to new fruit (17), the availability of fresh fruits and herbs (11), people’s reactions to tasting something for the first time (5), the response of children to the environment and tasting fresh fruit (14), community members coming together (13), profound or healing experiences of gardening or the natural world (8), the urban orchard as a vehicle for talking about social issues (6), and the excitement that comes with seeing fruit trees mature and produce over time (7). Link here to read some of our favorite POP partner stories from 2018! POP partner orchards serve a wide array of constituents across the city of Philadelphia, which are primarily neighborhood and community based. Some orchards serve specific demographics within a neighborhood or are in a neighborhood consisting of fairly specific demographics, while others are located in incredibly diverse neighborhoods. Many orchard partners have child, youth, or young adult based programming. Some are wide open to any and all people, and some prefer to work with a specific population. Some orchards are located within rapidly changing neighborhoods. On average, orchard partners self reported that 61.4 % of populations served qualify as low-income, which is close to the average of 65.1% reported last year. The change in reported low-income populations served may be a reflection of development and changing demographics in certain areas, a change in perception, or a change in estimation methods. Depending on the partner, these numbers were gathered via census data, FMNP voucher collection, HUD criteria, and well-informed estimates and guesses. This should be compared to other methods POP uses to assess demographics served, however our orchard partners know their communities the best and we will continue to value their reporting on demographics served. Our survey found that there were significant increases in regular attention, participation in regularly scheduled workdays, and the number of people participating in educational programming in our partner orchards. This past year 428 people participated monthly in orchard care (up from 2017’s 350), 2404 people participated at least once in orchard care, and 4,435 people tasted something grown in a POP partner orchard. 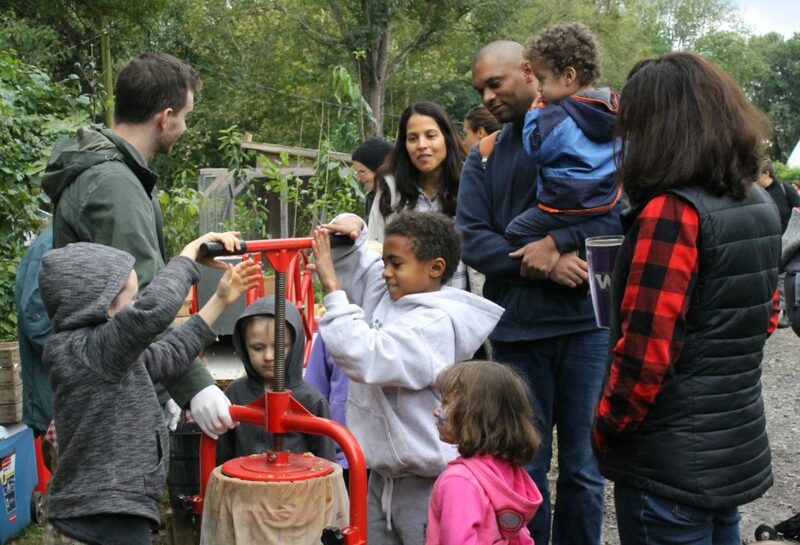 Larger gains were seen with 7,190 people participating in education programs in POP orchards (an 84% increase from 2017’s 3,900) and 8,923 people using a POP partner orchard as community gathering space this year (a 65% increase). These improvements in just one season are encouraging indicators that our increasing number of orchard spaces and maturing orchards are reaching more people. Partners reported that an all time high of 8923 people used POP orchards as community gathering space in 2018; this function also was most commonly rated as the highest value of orchard spaces by our community partners. Distribution methods vary greatly from one group to another, as expected from distribution plans submitted in partner applications and the varying missions of partner orchards. Similar to past years, over half (51.5%) of all recorded harvest yields at POP partner orchards were made available to community members for free. If averaging distribution methods across all partners, each partner weighted equally, over 70% of partner harvests are slated to be harvested directly by or distributed to community members for free either onsite or through outside emergency food service organizations. When accounting for production levels reported by each partner within their distribution methods, the scales are tipped heavily by 16 partners (30%) reporting much higher harvest weights than the majority of POP partners. It may be important to note that most of these 16 partners have well established plants, and thus more access to harvest, as well as some of the highest recorded rates of interaction with their orchards, enabling higher yield utilization and tracking of harvests. Most of these percentages are very similar to last year’s, except that free harvest by community members has decreased, and the percentage sold at on-site farmstands has increased again for the 2nd year in a row. The increased entrepreneurial use of these orchard spaces is most likely an indication of increased youth and community engagement through jobs, internships, and a need to consider economic components as a factor in sustainability. It should also be noted that the on-site farmstands led by our urban farm partners generally feature very affordable prices to accommodate their communities and a high percentage of sales are through FMNP or SNAP programs, meaning additional free distribution to Philadelphia residents in need. Total orchard production of over 3580 pounds was reported in 2018, and the majority of produce was harvested by or distributed directly to community members for free. In total, 21 orchards answered that their spaces had higher yields than last season, while 16 reported lower yields, 11 were unsure, and 4 were too new to answer. It is difficult to accurately track yield between spaces that are used in a wide variety of ways by different partners, including public spaces, organizations with limited or no staff, and where free harvest from community members is encouraged. However, estimates continue to improve with each passing season. POP has taken measures to provide partners with volume-to-weight conversion charts to aid in estimation, notebooks for writing yield recording, gifting scales when asked for in annual tool lotteries. As always, new orchards will have little to no production and should follow POP’s advice to remove all first-year fruit to enhance tree growth. Despite challenges in accurate tracking at some sites, aggregate yields reported by our partners correlate to and reflect climatic factors, pest and disease pressure, frequency of planting, and sometimes people branching out into new ‘fruiterritory’. Based on survey analysis of tree fruit production, figs, peaches/nectarines, Asian pears, plums and paw paws again had the highest yields, with pie cherries, plums, and apples seeing the most significant increases in yields since the previous season. These numbers are partially representative of the frequency at which POP partners plant these fruits, and numbers may be skewed by new or immature plantings. For example, despite most of our paw paw trees having a ways to go to reach maturity, paw paws show a higher harvest because they are the second most planted fruit tree next to Figs. Our most common fruits like apples, peaches, pears, cherries, and plums also face the most challenges in pest and disease, significantly impacting reported yields. While most nut trees planted at POP partner orchards are fairly immature, hardy almond yields are steady and should grow with more plantings in recent years. We saw a first recorded yield of hazelnuts, partially due to the addition of Saul High School’s mature plantings as a supported partner. It is important to note that 14 of the 39 full partner respondents are 4 seasons old or younger, meaning their fruit trees and berry bushes are immature or possibly too young to be bearing any fruit at all. Additionally, several POP Partner orchards are semi-public or entirely public. Whether intended to largely be harvested for free by community members or not (many of our partner orchards are), open public access mean a significant portion of harvests go unrecorded, which makes tracking orchard yields difficult. Weather was again a significant factor this year, but in a manner different from last. This year, a cold, cloudy, wet fall affected our fall harvests of European and Asian pears, apples and figs. Stone fruits, especially plums, saw a rebound in yields this year after being negatively affected by frost damage following early blooming due to a mild winter in 2017. It’s a good idea to plant a variety of fruits, so you hopefully end up with some production despite the challenges of a given season! 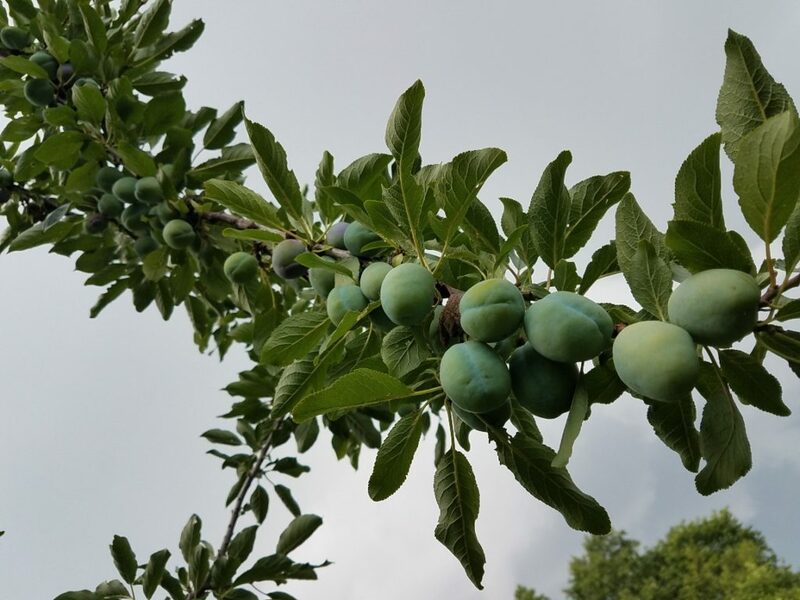 Plums were the fruit that rated most productive per tree in 2018, largely escaping crop losses due to early blooming that were problematic the previous year. For the first time, we also attempted to quantify the average productivity of each type of fruit tree. While it is difficult for us to accurately do this across all partner sites, our data does inform us what plants are producing well and are utilized by partners, reflected in their yield reporting. One should note that there are a hand full of 11 year old orchards coming into fuller fruit bearing age, a few mature “supported POP partner” orchards planted prior to POP’s involvement, several 5 year old orchards beginning to bear small quantities, and orchards between those ages all being averaged here, each with different arrays of tree crops. Totaling yields and number of trees across partners over 5 years old, we see that plums are currently by far the highest yielding and utilized fruit or nut tree at POP partner sites. Pie cherries and peaches follow, with a next tier of productivity for sweet cherries, pawpaws, and the recently producing hardy almond. Closely following, persimmons, apricots, figs, and asian pears are reliable producers across partner sites above 5 years old. The fruit trees our partners struggle with the most to get good yields are apples, largely expected given they are the most pest and disease prone of any species we plant. Mulberries and jujubes are likely underutilized and chestnuts have a ways to grow before full bearing potential. While sweet cherries seem to be mostly for the birds in some partners’ cases, some of our more uncommon fruits may continue to be underutilized because, well, they may still be somewhat unfamiliar to many folks. They also tend to be smaller and may require some processing. Berry and perennial vegetable yields were tracked again and we saw an increase in total yields and/or usage of smaller orchard fruits in 2018. However, we did see a significant reduction in reported raspberry yields this year. The previous year, many berry and perennial vegetables had seen a dip in yield or usage, which some crops (strawberries, blackberries, currants, goumis, and hardy kiwi) rebounded from in 2018. Some yields persisting at lower than previously reported levels may be a reflection of a number of things, including strawberry patches that need rejuvenation, brambles needing thorough pruning, fungal issues that affect Ribes species, changes in tracking methods, or maturing fruit trees beginning to shade out lower growing berries. POP partners reported increased harvest and use of culinary and medicinal herbs planted as companion plantings to fruit trees in food forests and orchards. Of total respondents, 42% of partners would like more assistance in learning how to make use of their orchard plants, down from a high of 72% reporting the need in 2016. This is an indicator that POP’s educational outreach has improved confidence in harvest utilization, while perhaps there is still a deeper level of understanding to achieve. As orchard ecosystems mature, an understory of plants in abundance contribute to better overall maintenance and orchard value. The use of these plants for nutrition, medicine-making, fiber production, culinary flavoring, and value-added products is still uncharted or mildly dabbled in territory for many modern farmers, though a way of expanding yields. The best ways to improve yields from all orchard plants and overall yields from orchards will be to increase capacity of orchard partners and community members in pest and disease management, regular orchard maintenance procedures, and yield utilization through educational programming, distribution of educational reference materials, and providing resources in the form of tools, pest and disease control supplies, and interpretive signage. When asked to rate challenges in the orchard from 1-5, responses from partners averaged out to 3, which is neither very easy nor very challenging. 30 respondents (57.7%) believe it was easier to maintain their orchards in 2018 than last year. It does seem that the orchards which are more mature and with more consistent caretakers across multiple seasons are becoming easier. Many spaces that reported higher challenges are also undergoing staff transitions, which can naturally create some difficulties in the continuity of orchard care. According to survey responses, 14 of our partners are going through definite staffing transitions and there are two foreseeable additions to that number. While we are aware of additional staffing transitions not represented in survey responses, this clearly demonstrates high turnover rates within the field of urban agriculture which may relate to wages and organizations’ abilities to employ full time. We find POP support to be helpful in these times of transition, as we are able to provide orchard history, orientation, and training to staff that are onboarding to orchard care as a new role. When comparing frequency of orchard care against rate of difficulty, an obvious takeaway is that we do see a correlation between challenges in orchard care and frequency of care. While those that report mild to moderate challenges fall across the board in terms of frequency of orchard care, all respondents rating orchard care as relatively or very easy tend to their spaces monthly, if not more often. Everyone reporting orchard care as ‘very easy’ tend to their spaces twice a month or weekly. This is understandably not possible for all partners, though we recommend monthly care to keep up on orchard needs. The most frequently identified challenge is the amount of time available and other responsibilities. While this is the first time we asked, this outcome is no surprise. Understanding the nature of being split between many responsibilities and needing to be most effective with your time and effort, POP has plans to craft a list of recommended practices for community and volunteer organizing to share with orchard partners this coming season. Organizing robust volunteer work days for certain tasks like weeding and mulching may take a load off your back, as the old adage indicates: “many hands make light work”. 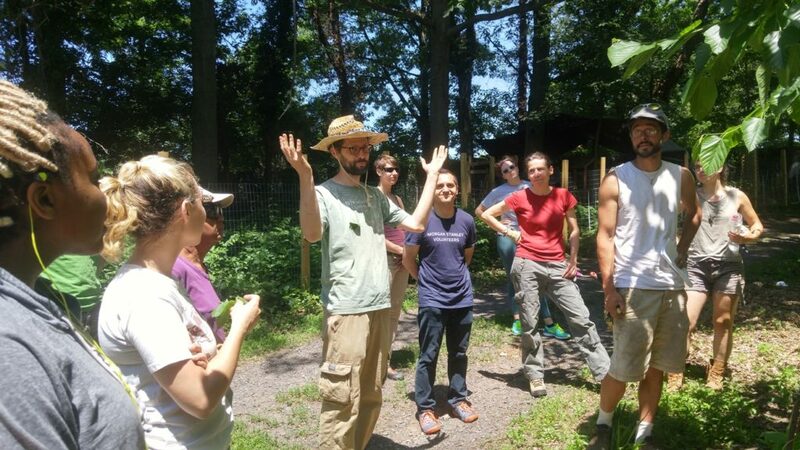 With time constraints and other responsibilities in mind (often vegetable production taking priority for urban farm partners), organizing or sharing leadership in monthly volunteer workdays in addition to POP visits could significantly lessen orchard challenges. The most commonly reported challenges in orchard production and percentage of orchards reporting these challenges were: available time and other responsibilities (59.6%), squirrels (48%), birds (40.3%), insect pests (34.6%), plant diseases (32.7%), weeds (32.7%) staffing transitions (26.9%), background knowledge (24%), and watering schedules (13.5%). POP sends out orchard care tips, pest and disease identification, as well as management information through our blog and email lists. When asked, 48% of partners are usually or always reading these tips, 36.5% are occasionally reading them, 4 never read them, and 4 newer stewards need to be added to our email list. With available time and other responsibilities being our biggest challenge and the modern age of overflowing email inboxes, this is understandable. It is important to note that all of our pest, disease, and orchard care tips are also available on our website, easily obtainable through our website’s search function. When polled, 46% of our partners do not utilize this resource when they discover an issue, though 21% often do, and 33% do occasionally. POP will continue to remind partners this is available and that guidance on most growing challenges is readily available. In 2018 POP created and shared easy to use, photo-based scouting guides to help orchard partners identify and manage pest and disease challenges. 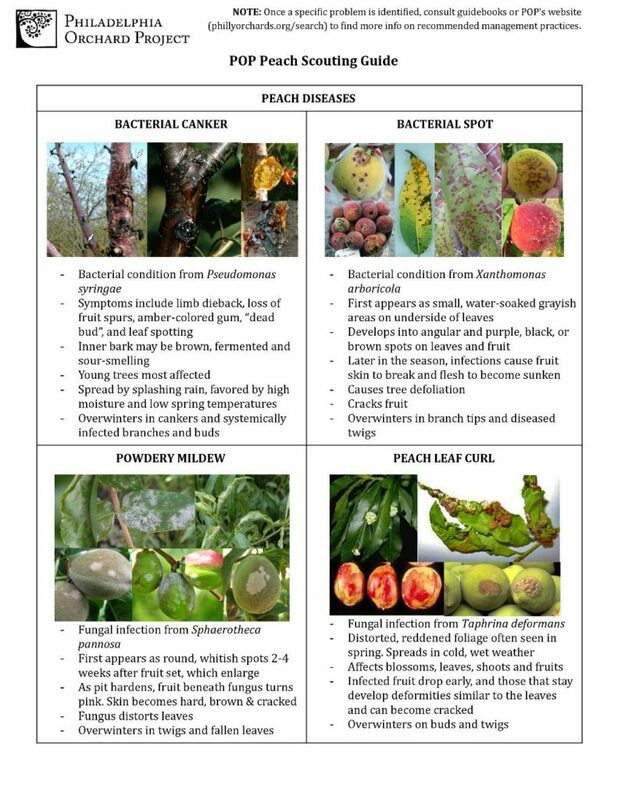 In 2018, POP released orchard pest and disease scouting guides for our most common and commonly affected fruits including apples, pears, cherries, peaches, and plums. While 37% (19) of survey respondents indicated they haven’t seen or used these yet, 60% (31) of respondents did see these and found them useful. When asked if we should produce more pest and disease guides, 85% of respondents said yes. In addition to supporting the production of additional pest and disease guides, 36 out of 52 respondents would like more guidance in holistic and organic sprays. Ultimately, a pest, disease, and spray calendar/guide could prove extremely useful, given the understanding that seasons vary and biological cycles of all players follow different timelines year to year. Pest and disease identification and management is the most complicated aspect of orchard care, requiring the most knowledge, time and resources to become well versed in. Highest reported diseases by POP partners are the most common and easily identifiable diseases. Based on this years responses, it seems that fire blight may be spreading; peach leaf curl is getting addressed; brown rot, black rot, gummosis and aphids are mainstays; pest and disease knowledge could still improve; squirrels and birds are having a field day; and we’re safe from the pear shrew for now. On average, partners feel that 19% of their yields are lost to birds and squirrels, and while we haven’t thought of how to solve this aside from extensive netting systems, obsessive trapping and the encouragement of bird predation seen at commercial orchards, we continue to inform our partners about recommended approaches to pest and disease. POP partners estimated that 16.5% of their orchard yields were lost to pest and disease in 2018. In March 2018, POP hosted its 4-part Community Orchard Resilience Education (POPCORE) course for the second time as a 4-week offering. Additionally, three of the four classes were offered at least one other time throughout the year. Among our partner respondents, Winter Pruning is our highest attended class at 18 partners, while attendance declines to 14 at Pest and Disease, 6 at Plants and Usage, and up to 9 at Permaculture. According to 2016 and 2017 surveys, at least 85% of respondents were interested in participating in these courses. However, 60% of this year’s respondents still haven’t attended any. Of those that haven’t attended, only four are not interested, with the remaining evenly split between definitely wanting to and perhaps wanting to attend. No one that has taken at least one class does not want to attend another, and all four survey respondents that attended the full course offering have indicated they would like to continue coming. While this survey is for partners only and our courses are offered to the broader public, this is a good indicator of the successes and challenges of the program. We are pleased to see those that have attended one or more classes are 100% interested in continuing. This indicates our educational offering is valued, and that perhaps our efforts to gather and incorporate feedback, update and include new content is inspiring return students. POPCORE offerings will continue to be held in multiple formats at different locations and times of year to meet the availability needs of our partners. Producing educational video content is also a new goal for 2019. Similar to 2017, there is an even split between a preference for a 4-week course in Winter and one course every 2-3 months. The March course has been more consistently well attended, as of course more growers are willing and able to attend a workshop in the off season. Day and time preferences were similarly split, with weekday evenings and Saturday afternoons being the most preferred. POP will continue to offer POPCORE courses in both formats and with both timing options to try to accommodate and reach the most participants. We asked our partners “Considering your natural tendencies, commitments, and accessibility, what is the best way for you to learn?” If you lump ratings of “good”, “great”, and “best” together, each mode of learning “works” for at least 50% of our partners, which reflects a natural spread of prefered learning modalities, tendencies, and personal availability. The #1 preferred mode of learning is hands on, working for 93% of responding partners. Hands on workshops were also highest category rated “best”, by 69% of partners. Perhaps not so surprisingly Philly, the 2nd most popular mode of learning was experimenting on one’s own with 83% happy to learn in the classroom of life. The next most popular mode of learning, a sign of the times, is video, which will work for 77% of our partners, followed by in person lecture at 75%. Published online materials work for 63% of partners, while hard copies and infographics both work for 57%. That said, there is a segment of partners that each of these categories doesn’t work for, and we should continue to diversify the modes we provide educational materials and resources through. The main barriers to participation in continuing education are cost, location, and time of day. 30 POP partner respondents indicated they are associated with a building or outdoor space that could host an evening or weekend class, with 9 additional partners potentially able to extend the opportunity towards us. 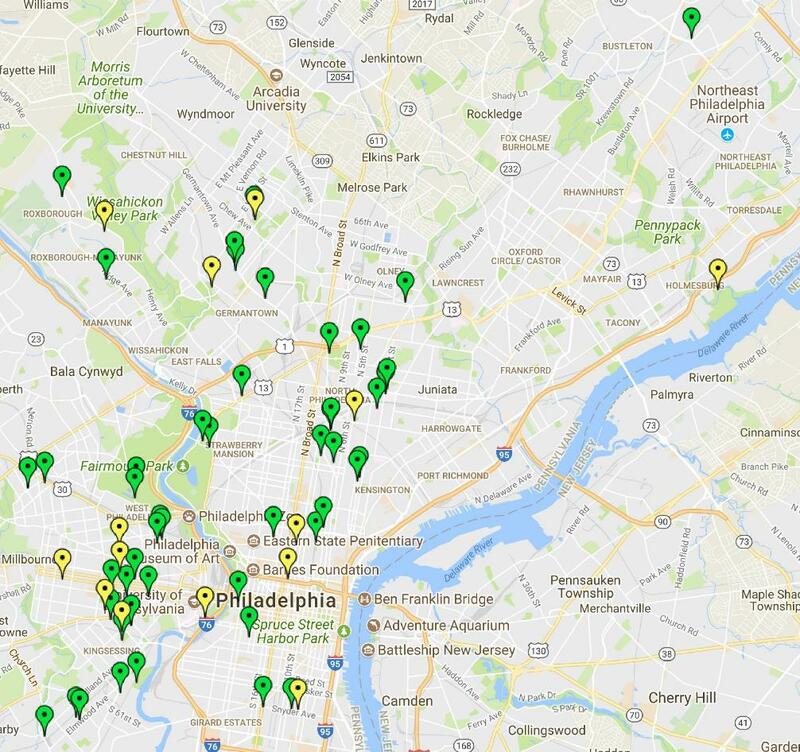 The ability to utilize these resources plays a large role in our offering of POPCORE and POP HarvestED workshops both in central and dispersed locations in Philadelphia on a sliding scale. Continuing to vary locations and times of workshops will make POP educational offerings available to the most people possible, while posting electronic materials as downloads or video and reminding partners these are available to help this information spread. Expanding our effort to highlight and educate partners and the public about unusual fruit, we piloted the POP HarvestED program in 2018 as an extension of our POP Harvest gleaning program. This new education program brings in community teachers to lead gleaning workshops focused on the end use of lesser known fruits, nuts, and herbs that are widely available through POP orchards and the Philadelphia region. This season we held four of these workshops on the topics of Ginkgo berry processing, Trifoliate Orange based fire cider, Herbal Oxymels, and Black Walnut processing for edibility, fabric dye, wood stain and medicinal properties. When asked, 87.5% of partner respondents would like to attend these workshops in the future whereas a similar amount have not attended any yet. This is an encouraging percentage, while only 42% of partner indicated they would like more assistance learning how to use the plants in their orchards. This may indicate POP partners are getting to know their plants, and that there is interest in this model of hands on community education with more unusual, yet abundantly available harvests. We intend to continue this series with 8-10 workshops in 2019. Suggested topics predominantly include nut and herb usage, but also a variety of specific plant care intensives, in-depth harvest preservation methods, propagation, permaculture, and tree tapping are desired. 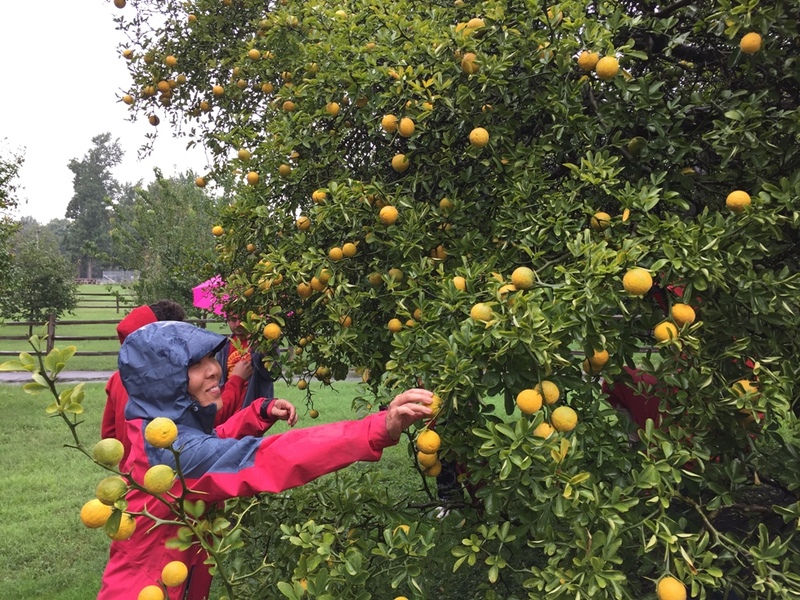 The pilot POP HarvestEd workshop series this year included an event harvesting trifoliate oranges at Historic Strawberry Mansion for use in making Fire Cider. On a scale from 1 to 10, respondents’ average rating of POP as an overall organization was a 9.2 (a tenth of a point higher than last season)! Partners continue to believe that POP staff are supportive, adaptable, and easy to reach, though there are always ways that we can improve. Some partner suggestions or desires include increased engagement through more frequent visits, hands on assistance, check ins and classroom time, increased number of volunteer orchard liaisons, increased staffing, more frequent plant health checks, collaborative facilitation of partnership and community building, spray tips and services, more plants, and help finding mulch. A number of partners wouldn’t change a thing and think “continuing to do what we do together will bear much fruit”. Pun intended. 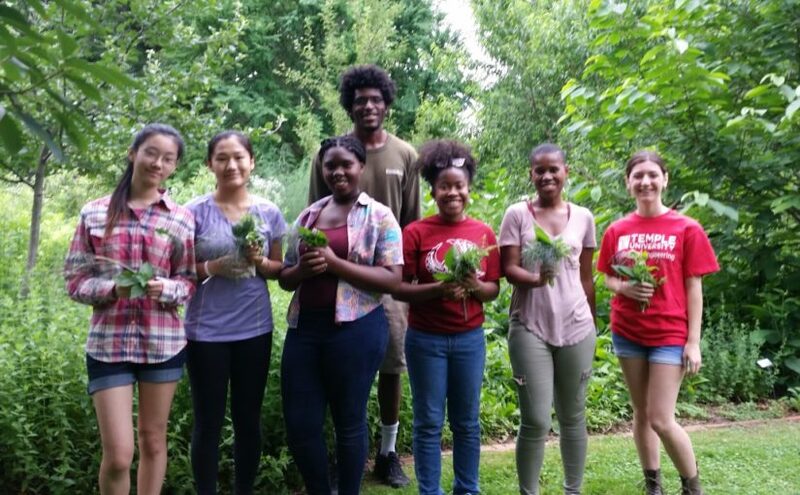 POP exists to support our Philadelphia orchard partners, primarily through educational programs and materials; hands on assistance in the form of consulting visits and volunteer workdays; and access to design services, plant materials, and tools & equipment. Our model and current resources allow us to do our best to visit each orchard quarterly, additionally on an as needed basis, while seeking to empower our partners through educational offerings. Due to limitations of staff capacity, it is unlikely that we will be able to visit most partner sites more than quarterly, but a solution for sites desiring more engagement may be in the orchard liaison system. By growing this program, POP staff hours can be multiplied to increase support across the city through a growing network of trained volunteer orchard liaisons. This alongside community and volunteer organizing recommendations may go a long way, while continuing to build out niche reference materials and workshops. Dedicating staff time to implementing and reporting back on a pilot program of more intensive pest and disease management practices at a few partner orchards will be a worthwhile step to take. As POP, our effort is best served empowering our partners to manage their spaces confidently as caretakers through our programs in the most effective and accessible ways that address a number of preferred learning methods. While POP provides information and experiences in a variety of ways, the production of video is a mode of instruction POP has not yet pursued. Survey responses indicated instructional videos would work for a majority of partners as supplementary learning opportunity, which may enable us to reach partners for whom attending workshops is a challenge. POP aims to pilot new educational video content in 2019. When asked “what would make 2019 better?” 3 or more partners self identified the following strategies or areas of improvement: more volunteers or staff, planning and leadership efforts, setting a schedule for one’s self, assistance identifying something, physical infrastructure, compost and signage. POP has developed plant signs for most of orchard and food forest plants we plant, though they have not yet been widely distributed. We are in the process of further developing these signs and identifying the most cost effective and weather/sun proof options. 34 POP partners that don’t have plant id signs want them and 6 partners need sign replacements. Additionally, we’ve also developed signs to explain what food forests and community orchard are. 35 partners want a food forest or community orchard sign, 11 have them, and 6 are uninterested. POP has steadily grown its staff, interns, liaisons, dedicated volunteers, and confident partners, as the capacity and understanding of what it takes to properly maintain orchard ecosystems in our network improves with each year. Despite the notion that orchards and perennial ecosystems are slow to produce and take care of themselves, the amount of time needed to learn care of the plants and ecosystems we work with, manage a range of growing challenges, and to harvest maximum yields is equally as great or greater. Patience, routine, time for observation, and preventing problems rather than treating them could be valuable, applicable orchard and life lessons. As such, much of the work POP pursues is attempting to shorten that span of time and bring awareness through hands on experiences and informational resources. POP continues to refine our efforts, programs, and support services based on the valued input of our orchard partners across the city. This blog post was written by Orchard Director Michael Muehlbauer with input from Executive Director Phil Forsyth.